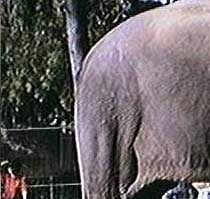 When I was a child, I remember going to the zoo and looking at the elephants with my Dad. "Look! That elefunt's got no head!" I said excitedly. We then moved onto looking at the hippo enclosure where the hippos were all wallowing in imaginary circles (it was a small enclosure without addequate facilities and they were all going slowly insane). 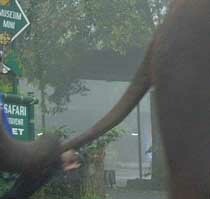 "What a bloody ugly elephant that one is." "No, son. It's not an ugly elephant. 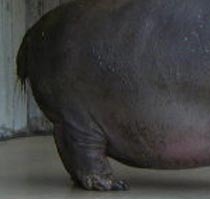 It's a pretty hippopotamous". 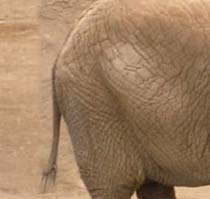 That zoo visit was quite an eye opener for me, I can tell you, and by the time I left I'd learnt to tell the difference between an animal's rump and it's face, and between a hippo and an elephant. But can you? The first part of my challenge is simple. 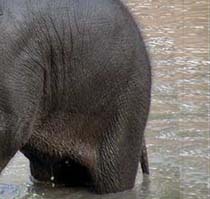 Can you tell the difference between an elephant and a hippo? Just by looking at it's arse. 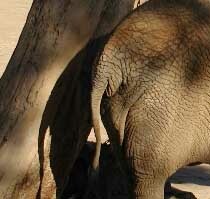 Who lives with an arse like this? The second part of my challenge is more difficult. 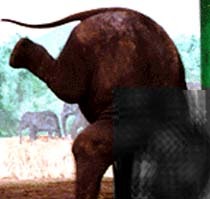 Below on the right is an African elephant and on the left is an Indian. You can tell the difference because the African has large ears, whereas the Indian has small. When I say 'small', you could probably still pick up Sky One if you hooked one ear up to your set top box and used it as a satellite dish. 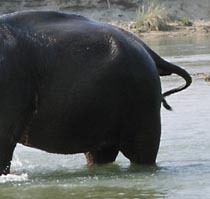 Indeed, they are often hunted for this purpose, with their Ivory tusks being used to make a top of the range waterproof remote control box, and their trunk converted into a cathode ray tube to make a telly. The rest of the beast can make a surprisingly comfortable sofa. Of course, you can make these things out of other materials but some people think it's more tasteful and 'classy' when something is made out of endangered species parts. Limited edition, you see. 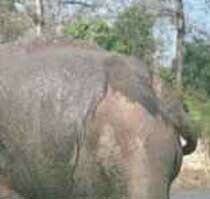 Anyway, can you tell the difference between an African and Indian elephant? Again - just by looking at it's arse? That's all. The code was adapted from the ones on b3ta.com. Subscribe to their newsletter now. 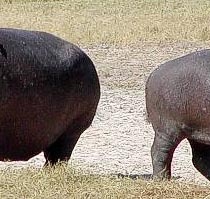 Can you tell the difference between a hippo and an elephant by looking at it's arse alone?.